'All happy families are alike but an unhappy family is unhappy after its own fashion.' This, the opening sentence of ANNA KARENINA, is one of the most famous in literature. But would it be better like this: 'All happy families are alike: each unhappy family is unhappy in its own way'? I've decided that it would, which is why I am reading the recent highly acclaimed translation by Richard Pevear and Larissa Volokhonsky for Penguin Classics instead of Rosemary Edmonds' 1954 translation in my old Penguin edition. I read the novel when I was a very young woman and re-read it, too. I agreed with William Faulkner. When he was asked to name the three best novels ever, he replied, ANNA KARENINA, ANNA KARENINA, ANNA KARENINA.' Mind you, I hadn't read Proust then. I've been meaning to reread ANNA KARENINA for a while. But at well over 800 pages it is a commitment. I suggested it to my reading group and we decided to have it an optional extra which we could spread over a year. When I picked it up a fortnight ago I put it down after a few pages. It seemed a bit stiff and old-fashioned. I wondered if the translation was to blame. This was a question that never occurred to me when I first read it. Maybe I am more sensitive to language and more detached than I was when I first read it, devouring it for the story, living almost every moment, not knowing what would happen next. I ordered the new translation, and now I am completely gripped. What a daring writer Tolstoy is. What writer nowadays would delay the entrance of the main characte until page sixty? And yet how important those introductory chapters are, how well they establish the themes of the novel, how absorbing they are. I am well over half way through and it is as brilliant as I remembered (though some of Levin's thoughts and discussions on Russian politics and agricultural economy are as dull as I remembered, too). That's for now. I'll let you know what I think when I've finished it. 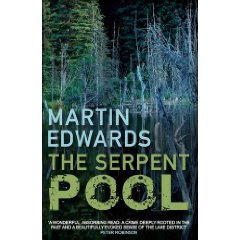 Martin Edwards writes, 'Books burn in the opening scene of my fourth and latest Lake District Mystery, The Serpent Pool, just issued in paperback in the UK. And the man who owns the books, an avid collector called George Saffell, watches bound and helpless as the flames race towards him. I can heartily recommend this fabulous Argentinian thriller, which is so much more than a thriller. It's a story too of middle-aged love, deeply romantic, and a meditation on justice. It's one of the most gripping films I've seen for ages. Having read so many crime novels and seen so many thrillers and film noir, I don't often have my breath taken away by the twists and turns of the plot, but I did here. And more than that it's the kind of film which you find yourself thinking about long after it's finished. While I am on the subject of DVDs we have finally reached the end of the sixth and last series of HOMICIDE. It had gone off the boil somewhat, but was still very watchable. I was sad to see it end and to say goodbye to the characters. It struck me that watching box sets is a very different experience from watching the programmes when they were first aired. When you see one episode a week and there is only one series a year you are closer to real time. In fact the series was spread over six years and six years passed in the world of Homicide. There are advantages to both. Now there is a HOMICIDE shaped gap in our evenings and suggestions of a crime series to replace it would be very welcome. Maybe we'll try THE WIRE again. Meanwhile we are absorbed by the Danish crime series, THE KILLING, which is showing on Saturday evenings spread over ten weeks.